This tutorial is talking about how to install Google Earth 6, the .bin package downloaded from earth.google.com and fix some problems during the installation. Now, you should get this start installing window and finally installation will finish without any problem. 13 users responded in " How to Install Google Earth 6 Beta in Ubuntu (with some problem fixed) "
Thank you so much. This worked like a charm for me in Mint 10. Is there any reason why this is such a PITA to get working? It’s stuff like this that keeps people away from Linux. But the fix of ugly fonts in GE that replaces old Qt libs shipped with GE with the newer system ones as symlinks doesn’t work anymore with this version. How to fix that new “old” problem in this version of GE? No error messages, I even got the Installation complete, congratulations, etc. Uncompressing Google Earth for GNU/Linux 6.0.0.1735…………………………………………………….. Altogether, it's a poor offering from Google. 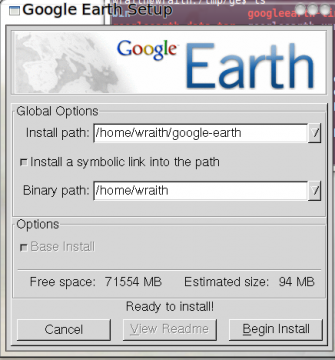 This must be embarrassing for them: there are multiple web-sites offering to solve the installation failures of GoogleEarth on Linux. So far I haven't found one which provides effective guidance for my configuration. Really, an organisation with Google's level of resources should test Beta code to remove the obvious installation defects before releasing it (it's Beta code, so I expect execution defects, but not installation defects). help how to fix this problem?? I’m using Ubuntu 10.4. I had to apt-get install lsb-core and it started working. This was with the full stable version 6 deb from the Google Earth website. I wonder how they missed that dependency? The startup-tips-error seems to have been fixed. I’m using ubuntu 10.10 you must install lsb-core!! can someone please help. I am running windows 7, not a computer pro but can make my way around just fine. My google earth downloaded fine, loads fine……when i search a city and try to click on one of the photos it takes forever for the photo to upload and show a message at the top of the screen “not responding”. have checked my firewall and all is fine, system requirements are fine……i have uninstalled and re installed a million times with same problem. Funcionou perfeitamente. Muito obrigado pela sua disposição em nos ajudar!